‘…we know Jesus is the absolute focus of this season, but we all need those songs to get us dancing around the tree (ideally wearing a pleasantly distasteful Christmas sweater and a party hat). We are all about celebration and we haven’t been scared to grab the banjo, dust off jingling-johnny and play some Christmas pop classics…’ Northern Irish indie/folk/worship band Rend Collective, signed to Integrity Music, have gained quite a fanbase and following as they, alongside other artists like Crowder and All Sons And Daughters, bring us something unique and refreshing to the worship genre that can be tired and uninspired at times. Already having released 3 studio albums and a live album, it’s time for a Christmas album- and while I was probably expecting the band to release Christmas material next year (it’s only about 7-8 months since The Art of Celebration), these men and women across the pond surprised us, me included, with a sequel to their campfire series and a collection of 11 tracks to focus us towards this holiday season, one that will hopefully remind all of us about the significance of Jesus’s birth and what it ought to mean for each of us as we reflect upon this fact as the year ends. In keeping with campfire tradition that was shown on Rend Collective’s earlier 2013 album full of acoustic guitars and a congregation of worshippers singing, Campfire Christmas offers us a similar experience- Christmas carols delivered in a way that we can just simply and humbly worship without the noise that often comes with the drums and electric guitars we have in modern worship/CCM. 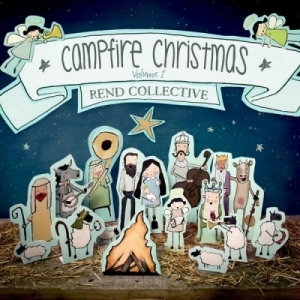 A worship experience with minimal instruments can be just as soothing and enjoyable as worship with a full band, and with Christmas coming up in just about a month, what better time for Rend Collective to show us their own take on Christmas carols than now? With a variety of traditional and obscure, this Irish band starts the album with “We Wish You a Merry Christmas”, and though not necessarily sung about Jesus’s birth or delivered as a worship song to our Father, the song still brings people into the Christmas spirit, regardless of the lack of spiritual aspect of the song. Wishing others a merry Christmas is something that’ll hopefully encourage non-churchgoers to think more about their own spiritual life, while also affirming and blessing others in their own Christmas and holiday festivities. “Ding Dong”, another obscure Christmas carol, and a song that many listeners may not necessarily know as a carol, brings the acoustic guitar and rousing hand claps and gang vocals to the fore to bring us a song about how ‘…the curse of sin is broken, ding dong, open up your eyes, the celebration’s starting…’ Ending the melody with a refrain of “Deck the Halls” gives us a great reminder that regardless of whether you love holiday melodies or Christ-centred Christmas songs, the December season and holiday as a whole, with all its carols, ought to be enough to bring people towards Christ and the church as we witness one of the most uplifting, enjoyable and inspirational times of the year. It would not be a Christmas album without carols, and on Campfire Christmas Vol. 1, lead singer Chris Llewlyn and the band offer to us fan favourites for us to collectively sing come Christmas time. With a rousing electronic keyboard, foot stomps and hand claps, “Hark The Herald Angels Sing!” is a powerful melody declaring the fact that angels sang when Jesus was born. With ding-dong bells adding a sense of Christmas joy and feel, we are reminded to declare alongside the band to ‘…joyful, all ye nations rise, join the triumphs of the skies…’; while “O Holy Night”, my favourite Christmas song of all, continues to excite as Chris and the team provide a soulful rendition full of light acoustic guitars and ukulele (the tag of ‘…o night divine, when love arise, o holy night…’ is a nice added ending to an already awesome song). While I felt that “O Come All Ye Faithful” wasn’t as lively as the song could’ve been, Rend Collective still bring us a thoughtful song of praise as we wonder whether we truly adore Him this season or whether we’re caught up in the glamour, presents and stress of the season; while the quintet remind us that hymns can still be sung during the Christmas season with a rendition of “Joyful, Joyful”. While my favourite version of the hymn will still be Brenton Brown’s recording with the added chorus, this version with a string quartet and a unique harmonious tag straight from “O Come, O Come Emmanuel” makes this version a close second. “Joy to the World” also has an interesting tag throughout the melody, as Chris and the team declare out the powerful words of how ‘…You are my joy…’, something that we need to consciously believe each day, and while I much preferred renditions of “O Come All Ye Faithful”, “Hark the Herald Angels Sing” and “Joyful, Joyful” better, Rend Collective still have highlighted their carol knowledge and experience of Christmas carols with yet another rendition of one of the most famous carols amongst both Christians and lovers of mainstream music alike. “Merry Christmas Everyone” and “For All That You Have Done” are the last two tracks on the album, with both of them being neither carols nor hymns. With both these songs fitting into the album line-up nicely, it goes to show us that we can still sing non-Christmas songs during Christmas-time, having similar impact to listeners to the powerful Christmas carols that seemingly bring both Christians and non-Christians alike to a sense of wonder and awe when the holidays come near. “Merry Christmas Everyone” is a fast-paced 3 minute melody about having a party, and knowing that ‘…it’s Christmas, the snow is falling all around me, children playing, having fun, it’s the season of love and understanding, Merry Christmas everyone…’, and with the banjo playing, this unique folk/country melody inserts a happy joyous moment that overflows into album ender “For All that You Have Done”, a song that borrows the melody of “Auld Land Syne” and declares the very truth that ‘…Your grace will never be forgot, nor mercy all my life, will be my source for every song, my story and my life…’ With bagpipes and other Irish music sounds, “For All That You Have Done” is a nice end to a Christmas album that’s sure to be one of my favourites for months and years to come! ‘…we called this album Campfire Christmas because that’s what Christmas is – an invitation into the family of God, to come and feel the glow. And though the world may be stinging and cold, we find warmth and hope at Christmas: our shining light of the world, our joy and peace, Jesus the Messiah…’ Rend Collective have released a fine Christmas album, arguably one of my favourites of all time alongside BarlowGirl’s Home For Christmas, Third Day’s Christmas Offerings and Lincoln Brewster’s Joy to the World. With a great mix of carols, covers and hymns, this unique campfire acoustically driven album is one to bring us to reflection as we realise that Christmas is a time of hope, encouragement and thinking beyond ourselves, even if it is for a short season during the year. Well done Chris and the team for such a heartfelt and poignant Christmas album, and one of my favourite acoustic-style albums of 2014 so far!